July 22, 2014 / Ned H.
Last week we introduced the website and today we wanted to give everyone a little background on the group so I asked Chad prepare a brief history of the Wisconsin Riders. Don't forget to sign up for Bike for Blue ! and while you're here leave your e-mail address for updates and special offers from us...we're still giving away free pig roast tickets. On May 17th, 2007 Deputy Frank Fabiano of the Kenosha County Sheriff's Department was killed in the line of duty. May 17th was also the birthdate of Sean Essinger, brother of Deputy Eric Essinger of the Washington County Sheriff's Office. Sean was killed in a traffic accident in 1998. Deputy Fabiano's death hit Eric very hard because the date was his brother's birthday. Shortly after Deputy Fabiano's funeral Eric realized two things; he had to get his health in order and he wanted to do something more than just attend the funerals of fallen officers. 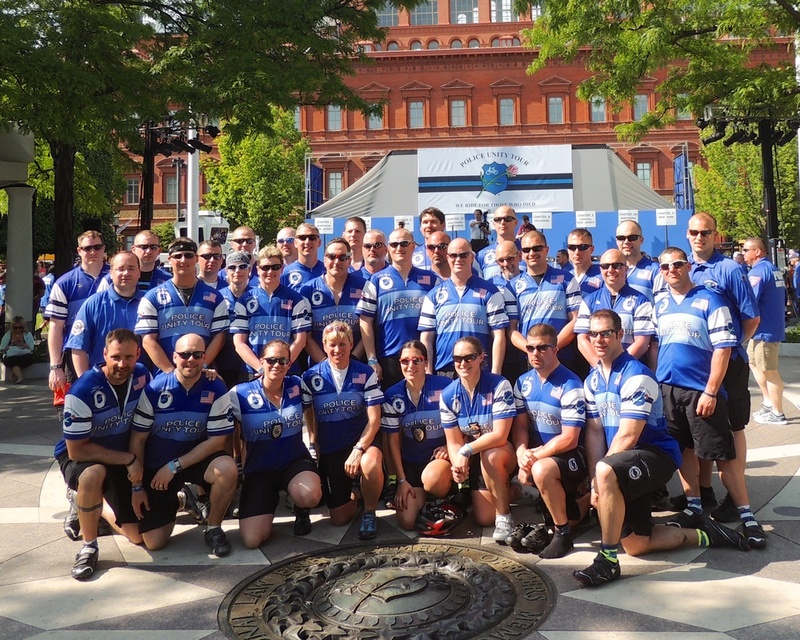 Later that year in September, Eric read an article about the Police Unity Tour. After reading the article, he couldn't explain it, but he knew two things; he was going to quit smoking and he was going to ride in the Police Unity Tour in 2008 to honor Deputy Fabiano. Eric began talking about the Police Unity Tour to Officer Matt Rohlinger from the West Bend Police Department and the two of them founded the "Wisconsin Riders" team. They enlisted the help of Deputy Don Kapla from the Washington County Sheriff's Office and Nick Garro from the Slinger Police Department. So these 4 officers participated in the Police Unity Tour in 2008. Eric and Matt rode their bicycles while Don and Nick were on the support team. Eric said recently, "It was perfect timing for me to get my health in order and I was in a place at work where I could add another task, I just didn't know it was going to be one of the best things I've ever done in my life." The Wisconsin Riders team has grown every year since then. In 2014, we had 31 riders and 2 support personnel representing 15 different law enforcement agencies and the Wisconsin Chapter of C.O.P.S. Participating in the Police Unity Tour and honoring our fallen brothers and sisters has been one of the most important and influential things in our careers. As the Police Unity Tour's motto states, "We Ride For Those Who Died" and we ride to ensure our fallen are "Never Forgotten." The Wisconsin Riders in 2008 and just a few more Wisconsin Riders in 2014. Check out photo galleries and videos from all our previous rides here.